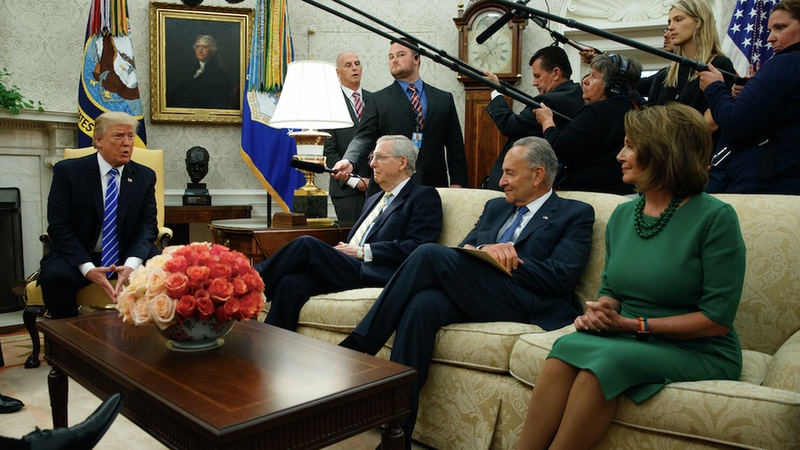 President Trump sided yesterday with the Democrats on key legislative issues, including government funding and raising the debt ceiling. The move upset Congressional Republicans and left many others speculating about Trump's motives. We've gathered a few of the theories about Trump's decision. Axios' Jonathan Swan: "Trump is enjoying watching McConnell and Ryan squirm. He personally likes neither of them and has, in the past, demonstrated more affection for Schumer and Pelosi. It's not much of a stretch. Trump has spent much of his adult life as a Democrat, in Manhattan no less." Wall Street Journal Editorial Board: "Mr. Trump is sore that Republican leaders failed on health care, so he now undermines their fiscal strategy and all but hands the gavels to Democrats." PowerPost: "The deal may also benefit Trump by allowing him to revive his threat to shut down the government over wall funding." Russell Berman in The Atlantic: "A frustrated president, bereft of legislative wins and desperate to make a deal, turned away from his party and into the unlikely arms of the opposition." Glenn Thrush & Maggie Haberman in The NY Times: "But the president also relished the opportunity to confound critics who accused him of abandoning campaign promises to govern as a bipartisan, deal-cutting businessman." Ben Domenech in The Federalist: "So he's being more honest: he doesn't like McConnell and Ryan, never did. He likes Chuck Schumer, and knows him, and thinks he can work with him. And he knows Chuck always makes money for his partners." E.J. Dionne in Wash Post: "The improvised character of the Trump presidency owes to his inclination to see politics as entirely about public performance. He cares above all about the reactions he arouses day to day and even hour to hour." Josh Barro of Business Insider: "Trump may have hit on an insight: If Republican voters will like him no matter what, he can become popular by doing whatever Democrats want."